A Texas man died Monday one day after reportedly shooting himself while handcuffed in the back of a police car. According to a statement from Austin, Texas, police, 19-year-old Zachary Khabir Anam died at University Medical Center-Brackenridge, ABC News reports. Anam was taken into custody Sunday at the Barton Creek Square shopping mall after being detained by private security officers on suspicion of shoplifting and carrying a controlled substance. Interim Police Chief Brian Manley told ABC News that Anam was handcuffed in the back of a patrol car heading to police headquarters in downtown Austin when he managed to reach around to his right side, grab a handgun that was hidden in his waistband and pointed the weapon at his own head with threats to shoot himself. The unidentified officer at the wheel stopped the vehicle, got out and ordered Anam to drop the weapon. Back-and-forth threats went on for six minutes until Anam shot himself, Manley said. Manley said that confrontation was captured on the dashboard camera of the police car trailing the one Anam was riding in. A police spokeswoman would not say if Anam had been searched thoroughly for weapons, but Manley said that would be the focus of an internal investigation Monday. Even if the suspect had been previously searched and handcuffed by the private security at the mall, Austin Police Department policy holds each officer responsible for searching each person taken into custody for weapons. The officer who had Anam in custody has been with the force for 11 years. It’s puzzling that a man suspected of shoplifting was not thoroughly searched by both the private security in the mall and the police officers who came to take him into custody, especially given that he was also accused of carrying a controlled substance, something that officers could have determined only by searching him in the first place. Even more puzzling is how a man handcuffed in the back of a police car managed to get a weapon out of his waistband, angle it properly to shoot himself in the head and threaten to do so. 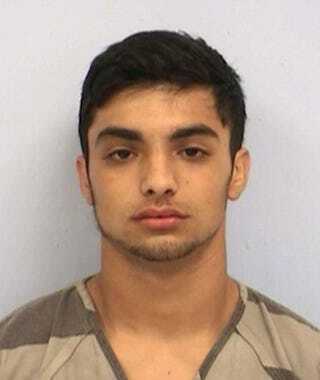 Anam was no stranger to law enforcement; in April 2016 he was arrested for drug possession, and in May 2016, Austin police issued a warrant accusing him of engaging in a string of burglaries and auto thefts. There does not appear to be any previous mention of him engaging in violent crimes or carrying a weapon.